CIS170 Week 4 lab in c# – 100% score. CIS170A Week 4 lab in c# – 100% score. CIS170B Week 4 lab in c# – 100% score. CIS170C Week 4 lab in c# – 100% score. You will code, build, and execute a program that simulates the dialing of a phone using methods. •	A zipped Visual Studio project folder for each programming exercise. Refer to the Deliverables section of the Week 1 iLab page for detailed instructions on how to zip a project folder. NOTE: A screenshot of a window can be created by first clicking on it to activate it. Next, press the key or key combination your specific computer uses to do a “print screen” (typically the Prnt Scrn or Prnt key in combination with the ctrl or FN key). Then, click the MS Word “paste” option to paste the screenshot into the MS Word file. •	Distinguish between by value, by ref, and out parameter types. •	Call class methods using by value, by ref, and out parameters. •	Write your own class methods using by value, by ref, and out parameters. •	the degree to which an exercise’s specifications are met. Your mission: A prepaid phone service needs a program that converts alphanumeric keyboard input into a phone number. The user will input eight characters and the program will output either an error message or the translated seven-digit phone number. The input may contain digits, letters, or both. Letters can be uppercase or lowercase. 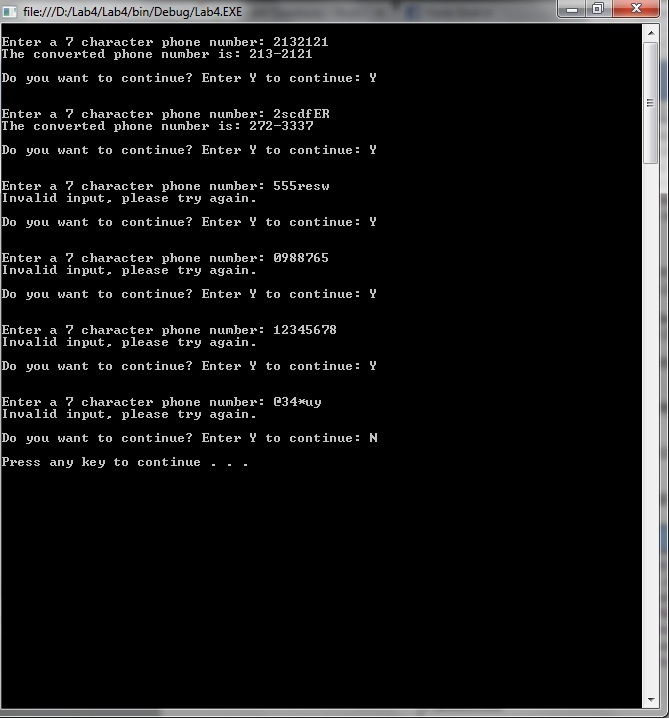 The program will perform the conversion per a standard telephone keypad layout. The program implements the following methods. •	GetInput(): Gets seven characters from the user and stores them into the seven variables Main() has passed by reference. •	The first character is 0 (seven-digit phone numbers can’t start with 0). •	The first three characters are “555″ (no phone numbers start with 555). •	Any character is not a digit or an uppercase or lowercase letter. •	ShowResults(): Writes converted telephone number to the screen, inserting a dash (-) between the third and fourth digits, and accepts the seven character variables from Main() by reference. Best practice: Don’t try to write too much at a time! First, write an outline in comments based on the requirements and the pseudocode. Then, implement declaring seven char variables. Make sure to fix any compiler errors before implementing more. Then, write and call an empty GetInput() method that accepts parameters, but does nothing but return a dummy value. Make sure you can pass the seven character variables by reference without compiler errors before implementing any of the GetInput() logic. Keep working incrementally like this, testing as you go. Set breakpoints and use the debugger at each phase to make sure your logic is working correctly. Then, use the same approach to implement the other methods. Test each phase with valid input before handling any invalid conditions. o	Use a switch statement to translate characters into their corresponding digits.